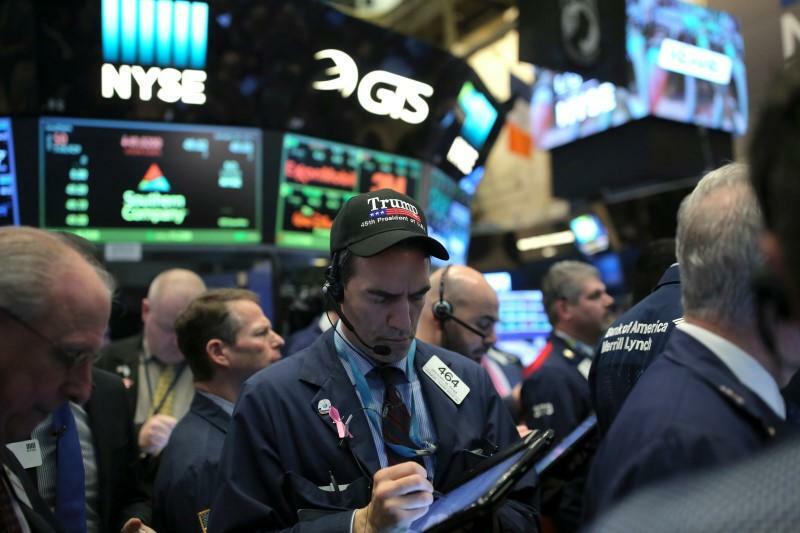 NEW YORK (Reuters) - Wall Street has tempered its expectations for sweeping U.S. tax cuts in the wake of President Donald Trump's stinging healthcare defeat, a move that could push investors to embrace cheaper global stocks after the heady U.S. rally of recent months. The White House turned its attention to an overhaul of the tax code after Republicans were forced on Friday to pull legislation that would have begun dismantling the Obama administration's 2010 healthcare law. Trump made tax cuts, including a lowering of the rates paid by corporations, a pillar of his 2016 presidential campaign. His Nov. 8 victory whetted the appetite of business and investors who saw passage of a tax bill as a virtual slam dunk. But the Republican infighting that doomed the healthcare bill in the House of Representatives and the evaporation of the savings that it was seen generating have made the endeavor more problematic. "Now it appears some of the initiatives in the tax bill will have to be scaled back or even eliminated," said Robert Willens, an independent tax analyst. "It clearly has to be less ambitious." Others are even less optimistic. "Getting corporate tax relief done in 2017 has gone from a decent chance to remote," said Michael Purves, chief global strategist at Weeden & Co. "That's a huge contributor to potential earnings." Economists at investment bank Goldman Sachs see "some downside risk" to their original expectation for a tax cut of around $1.75 trillion over 10 years, though they still see a deal passing. Trump has said he wants to cut corporate taxes to a range of 15 percent to 20 percent, from 35 percent. A watered-down version of his tax goals could rattle the concern among money managers that U.S. equities' valuations are stretched. Analysts expect S&P 500 profit growth of 11 percent this year according to Thomson Reuters data - with many analysts not yet baking a tax cut into that estimate - a big increase over 1.4 percent growth in 2016. "What (the healthcare bill failure) does in my mind is further emphasize the case for international and emerging market equities," said Jack Ablin, chief investment officer at BMO Private Bank. On a forward price-to-earnings basis, the U.S. market is around the most expensive it has been in years compared with the United Kingdom, Europe and emerging markets. Against Japan, it is at its most expensive in at least six months. Investors in U.S. stocks are paying almost $18 for every dollar expected in earnings over the next 12 months, compared with just above $14 for stocks on the London, Tokyo and European exchanges, and near $12 for those on emerging market exchanges. More upside is seen in European markets this year. Reuters polls on Wednesday predicted a gain of under 3 percent in U.S. stocks between now and the end of the year versus a rise of between about 5 percent and 6 percent for the STOXX 600. (.STOXX) and Euro STOXX 50 <.STOXX50E>. "Making an argument for Europe over the U.S. is very easy at this point," said Matt Burdett, a portfolio manager at Thornburg Investment Management, which has $49 billion in assets under management. Dave Wright, a co-portfolio manager of the Sierra Strategic Income fund, which manages $2.3 billion in assets, said the U.S. market looks "substantially overvalued." Reflecting the growing appetite U.S. investors have for overseas assets, U.S.-based European stock funds attracted $636 million over the latest week ended March 22, the largest inflows since December 2015, according to Lipper data. The four-week moving average of inflows for these funds totaled $328 million in the latest week, the highest amount since January 2016. For the same period, U.S.-based equity funds posted net cash withdrawals of more than $1 billion, Lipper data showed. Still, investors are unlikely to bail out of U.S. equities based on the fate of the Trump tax plan alone. Jason Ware, chief investment officer at Albion Financial Group, said "whether or not they hit 20 percent corporate tax rate or 25 percent is immaterial when you look at the big picture."